This window, placed here in 1878, commemorates Joseph Coulthard who died in 1871. He was the first headmaster of Brampton National school, and later the founder of a private school called Croft House Academy. 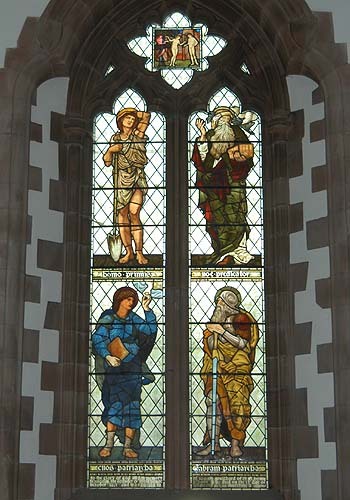 The windows consists of four large figures (clockwise from top left) Adam, Noah, Abraham and Enoch or Enos. If you can't see the menu on the left, select here for the website of St Martin's Church, Brampton, Cumbria.